"Overwhelming popular demand" pushed Precursor to start crowdfunding via Kickstarter as well as its own campaign. 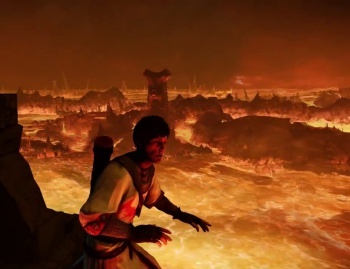 It seems like only yesterday we were talking about Shadow of the Eternals, Precursor Games' new horror title, kicking off its crowdfunding campaign. By running its own fundraiser Precursor, Denis Dyack's new home, figured it could avoid paying those pesky Kickstarter fees, as well as collect the backers' money up front without having to worry so much about whether the campaign would meet its $1.5 million target. Things have changed since those far-off days of yore, and now Shadow of the Eternals has a Kickstarter campaign of its very own. "Due to overwhelming popular demand," Precursor claims, this step was taken, allowing pledgers "even more options to contribute to the game." This doesn't mean Precursor's campaign will stop, though at the moment it's only raised a few bucks shy of $157,000 towards its target, with 23 days left on the clock. Instead, the two campaigns will run in parallel, with Kickstarter seeking a slightly more modest $1.35 million. Already 532 brave Kickstarter backers have donated close to $33,000, with 35 days to go. Pledgers should remember that Kickstarter, unlike Precursor's pledge drive, won't take cash from anyone unless the campaign reaches its target. As before, this Kickstarter target only covers the pilot. Other episodes presumably will have their own funding drives. This latest development does allow Precursor two shots at making this work, which might make life easier for the developer, particularly given its inauspicious past. That said, you have to wonder how likely it is that the $1.35 million Kickstarter target will be met. Precursor's own crowdfunding effort is off to a sluggish start, and without some kind of cash to pay licensing and development costs, Shadow may remain just a shadow after all.